After USA's recent success at the Golden Globes last week, it's easy to expect big things from the network that brought us the sleeper hit of 2015 with Mr. Robot. Sadly, their new attempt to break the Internet with a sci-fi blockbuster entitled Colony, fails to deliver the goods. Labeling the show as a failure is too cruel a thing to say after just one episode, since what this Carlton Cruse (Lost) produced show does bring to the table is potential. Oh yes, that dangerous "p-word" lingering behind everything that "could be" with a show that looks this good. 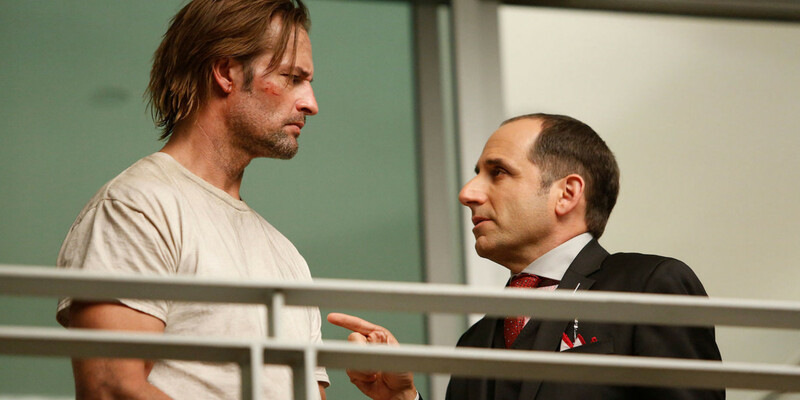 Even with all of its overused tropes, Colony has some good things going for it as well. Besides the impressive visual effects, the cast led by Lost alum Josh Holloway carries the unimpressive script as best they can. Holloway is equal parts charisma, charm and good looks wrapped into the perfect TV-star package. His character is Will Bowman, who lives with his wife Katie (Sarah Wayne Callies) and their children in suburban Los Angeles. All in all, they are a normal Caucasian family, except for the fact that their city has been taken over by a force known only as "the occupants." Going back to the weaknesses, the show feels too normal for its own good. Unlike Mr. Robot, that feels utterly unique and diverse, Colony resembles a world we've already lived in. Like the remake of V back in 2009, this show just needs that extra bit of spice to kick it up a notch. Cooking phrases aside, Cuse and his co-creator Ryan Condal have a solid canvas to paint their way out of this mediocre portrayal of an "alien" invasion (at this point we do not know the identity of the occupants). Another cast member worth noting is Peter Jacobson (Ray Donovan), who is the most colorful character on screen with his portrayal of Proxy Snyder. After learning about Will's secret identity, Snyder asks the former FBI agent to track down those who would like to see the occupation come to an end. The big twist at the pilot's conclusion reveals that his wife (Katie) is a member of that same resistance he's been tasked to root out. This doesn't seem like that big of an issue. Sure, Will is stuck between a rock and a hard place, but there's no threat that he's actually going to hurt his wife. From what we know so far, Will appears to be the ideal husband who always comes home on time. The weakness here is that there's no real threat apart from Will and Katie being on opposite sides of a revolution. There is also a son that lives in the Santa Monica Zone and the deal is that if Will does the occupation's bidding, then Snyder will help find their missing child. So, perhaps Will will just play along until that goal is accomplished? Only time will tell. Colony could be a better series than its letting on, but potential can only carry a show so far. In an over-crowded television landscape, simply being "good" isn't enough to pull you out of obscurity. There are just too many quality series for people to choose from and from what we've seen in the pilot, Colony doesn't have enough of that quality for this reviewer to give it a solid recommendation. Many of our favorite shows are coming back after their holiday slumbers. Are you going to make time for Colony as it progresses through its first season, or have you seen enough? Stay tuned to see what happens next.